When I heard that the Bank of England were going to replace the historical British figure on the £20 note from economist Adam Smith to someone from the arts, my first thought was that the figure should be William Morris. I first became a fan of Morris’s work when I picked up The Wood Beyond the World in a second hand bookshop in Machynlleth (who could resit that title?). Since then I’ve written a Masters thesis on his prose romances, and reviewed several books for the Journal of William Morris Studies. Unlike most other artistic figures, Morris produced beautiful art in a wide range of mediums. Literature (poetry, prose, and essays), translation, wallpapers, tapestries, book design, typefaces, paintings, interior design… you name it! This range means he has a wide appeal. I recently visited a friend’s grandparents who have Morris willow pattern curtains and cushions; they appreciate him as a designer. Another friend of mine raves about News from Nowhere (and the actor/author Robert Llewellyn is a celebrity example of someone who has been profoundly influenced by that work). Still others love how he took the best things of the Middle Ages into his own time. If Morris was on the £20 note, lots of different people would appreciate him for different reasons. Having said that, Morris is not as well-known as he should be. Most people would probably only recognise one of his designs, or his name, and not know about his life or philosophy. 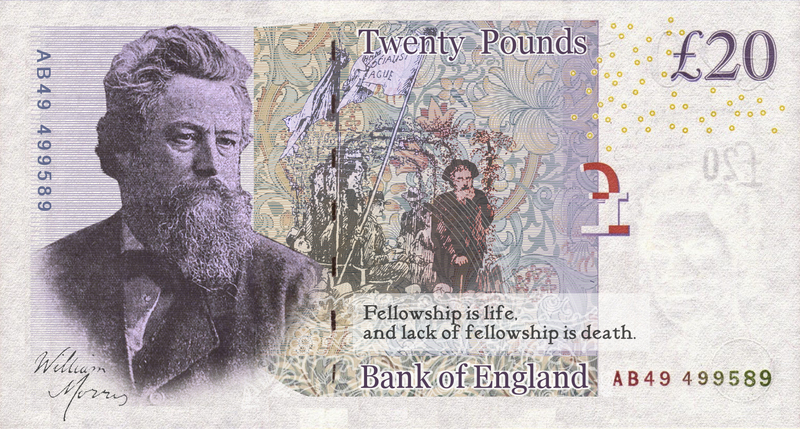 Putting Morris on the £20 note would increase people’s knowledge of him and promote him as a national figure, rather than just someone that people are vaguely aware of. Morris’s private life is also very inspirational. He worked hard all his life and fought for what he believed in. He was good to his workers and cared for his epileptic daughter, at a time when families were more likely to ostracise members who had long-term illnesses. It’s nice when the person on your money isn’t an arse-hole. Bank note designers often use complex designs to foil forgers. Ideally these designs also need to look aesthetically pleasing. Usually these patterns are completely unrelated to the figure featured on the note, but complex and beautiful patterns is Morris’s thing, so designers have the opportunity to actually use Morris’s work in the note itself. My design uses a quotation from Morris’s A Dream of John Ball which I think summarises a lot of Morris’s philosophy. The quotation is set in Morris’s own Kelmscott typeface. The image in the middle is Walter Crane’s sketch of Morris speaking at a socialist rally in 1894. I’m not the only one to think of Morris, either. The Guardian ran an editorial making the case of Morris, and the BBC’s Art Editor, Will Gompertz, also argued for Morris (whilst at the same time making a separate case for Julia Margaret Cameron). If you want to nominate Morris for the £20 note, you have to be fast! Nominations close on July 19th.